The SQL Server provides various SQL String Functions, which allows us to alter the individual characters in a string, compare strings, search strings, extracting sub strings, copy of string, and to convert strings to lowercase or uppercase. This article shows you the available list of Sql Server string functions and their definitions. The following table will show you the list of available SQL String Functions. Use those links to see the practical example for each one of them. ASCII It returns the ASCII code of the left most character of a character expression. CONCAT Combine two or more strings and returns string. CONCAT_WS Concatenate two or more string using seperater. FORMAT Format the expression with the specified format. REPLACE We can use this function to replace the existing string with new string value. REPLICATE Repeat the existing string for given number of times. RTRIM It removes empty spaces from the Right hand side of a given expression. PATINDEX It is used to return the starting index position of the first occurrence of a pattern in an expression. SOUNDEX It returns the SOUNDEX code. SPACE It is used to return the string of repeated spaces. STR It returns the string representation of the numeric expression. STRING_ESCAPE This function will escapes the special characters from the text. STRING_SPLIT Split the character expression using the separator. SUBSTRING It returns specified number of characters from the given expression. TRIM Remove the empty spaces from both right and left side of a string expression. 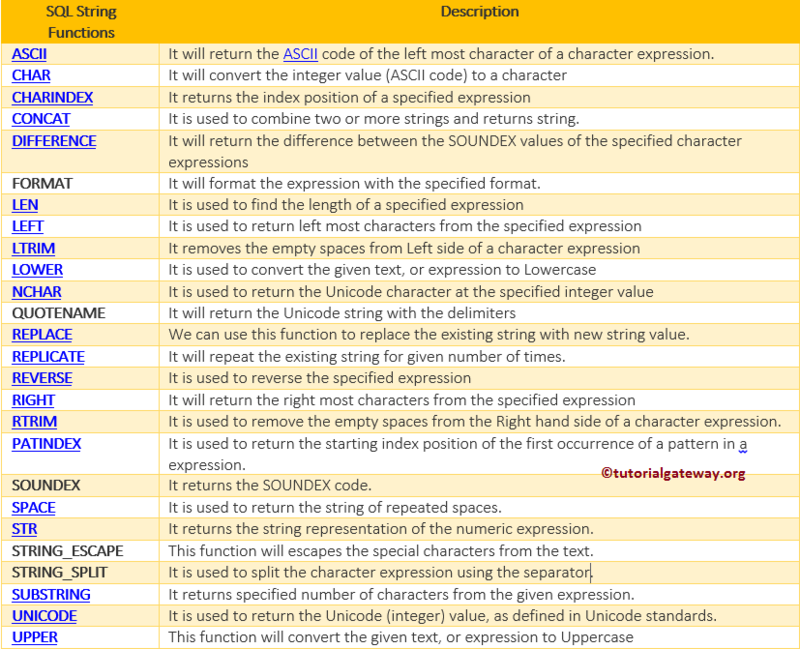 UNICODE Return the Unicode (integer) value, as defined in Unicode standards.